Firstly, the antioxidant is 1,000 times more powerful than any other on the market and secondly, the makers claim, it’s the only one capable of penetrating deep enough into the skin to make a significant difference to wrinkles. And the claims are not hype – they have been validated by a Nobel Laureate Prize to the Cambridge scientist behind it and in prestigious scientific journals. MitoQ has been scientifically engineered from the antioxidant CoQ10, found naturally in foods such as sardines, and essential to a healthy heart and brain. But what makes it so potent, as well as its strength, is it’s ability to pass through the outer layer of the mitochondria (these are the energy powerhouses inside every living cell) and where the MitoQ is used as fuel. The mitochondria are subsequently able to function more efficiently as a result. 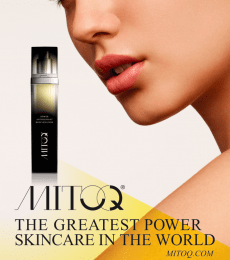 MitoQ promises a real improvement for ageing skin where damage is accelerated by the sun, smoking and a poor lifestyle. The quality of the skin cells deteriorates and they are less able to fight off further damage from free radicals – these are the damaging byproducts of the living process. When the cells replicate they do so less efficiently resulting in fine lines and other signs of ageing. When MitoQ is topically applied to the skin, it passes through to the mitochondria, which are re-energised, giving the skin cells better quality fuel, so that they are rejuvenated and able to lay down better quality collagen – thereby making the skin younger. At the current time, the only other ‘power’ antioxdant being used in anti-wrinkle creams is idebenone which is an ingredient in Prevage by Elizabeth Arden (£105, 30ml) – MitoQ is 1,000 times more powerful. Manufacturer, MitoQ Ltd, is backed by New Zealand and US investors, has decided to launch their product without hype – ie no celebrity face or endorsement and with their miracle ingredient in a base cream generally used for babies bottoms. This entry was posted in News and tagged anti-wrinkles, ATP, CoEnzymeQ10, CoQ10, energy, idebenone, mitochondria, MitoQ by Editor. Bookmark the permalink.